Last summer, I shared some thoughts on the stock markets’ abilities as a discounting mechanism for future events. The gist was that stocks may provide a murky read some times when it comes to prophesying. Reading the current macro signals is a tough endeavor for any speculator, and with today’s volatility, all the more dangerous when making bets based on those signals. Kimble recently provided a long-term view of two key sectors. We’ll revisit the impact of the breakdowns in those sectors, but the whole world of finance is focused on the potential resolution of Greece’s debt-financing problems. We have Goliath, the Troika(ECB, IMF, and European Commission “EC”), attempting to dictate the how, what, and when to David aka Greece. Right now a political game of poker is being played with the potential for worldwide ramifications. Greece’s new management is playing the hand it’s been dealt in what appears to be a very transparent fashion. Basically, they’re happy to stay in the euro as long as fair terms are met in a reworking of current debts to the Troika. The Troika, god I hate saying that word but it does beat out typing the three entities, is really trying to play hardball with Greece but they have no leverage. None. Ok, maybe the smallest amount; just to play chicken. In my estimation, 98% of the leveraging power belongs to Greece. Dijsselbloem, EC head finmin, and Schauble, German Minister of Finance, have both been bellowing the fiery rhetoric from the tops of their lungs, “Greece better pay or else!” Or else what? They’re going to let Greece depart the euro? Ok. Yeah, sure. Greece isn’t going back to the drachma in an exit from the euro, at least not this year, because the markets would be roiled. There are simply too many things that could go wrong to upend the European status quo for a Grexit to happen. Let’s just logically play out a generic sequence of events. Europe can’t let Greece totally default. For the owners of Greek debt and of course credit default swaps on the debt, credit events would be triggered across a multitude of financial institutions which could in turn then trigger counterparty liquidity risks which would instantly panic the financial universe. This instant panic would hit all the developed stock markets but with a focus on the European stock markets, which would negate the positive effects of the trillion-euro QE plan before it even had a chance. Too me, that’s enough to know that even if the deadline for a Greek debt resolution is pushed out, it’s still going to end with Europe caving but in a manner which saves as much face as possible. Germany’s account surplus is so ridiculously large that I don’t really think they are going to tell Greece to go souvlaki itself. German total employment is high and exports continue to be robust. Pushing Greece to exit the euro would create an environment of fear where recession could rear its ugly head at a time when German companies are rolling. While Greece has all the appearances of being the linchpin holding the euro together, they’re really just a very, very important lugnut. Italy is the real linchpin. Their debt has the potential to topple the world. Which is why Europe doesn’t want to easily concede to Greece and open the door for Italy to dictate revised terms of its sovereign debts. Aside from Italy, there is obviously still Spain, Portugal, and Ireland; but Italy is the megaton nuke that can change everything. Aside from the financial obstacles for Europe, there are the more important political complexities that must be addressed in pushing Greece too far, too hard. Russia has already extended an olive branch for Greek funding and Greece officials are reporting that China has now offered a helping hand. The world knows that China possesses the funds to help provide a financial backstop for Greece. I suspect the world may doubt how much funding Russia can lend in light of its own domestic problems concerning the ruble’s decline alongside oil’s rout. I contend that doubt would be misplaced. Does anyone really believe that Europe would simply push Greece into Russia’s waiting and open arms, where after, Greece will be free to negotiate any number of fear-inducing considerations like the usage of Greek ports for the Russian navy. Or how about land or sea allowances for petroleum energy pipelines. Maybe missile battery emplacements “for protection” on the northern Greek borders. These are extreme examples as Greece is still a NATO participant, but it is unknowable with which the speed of certain actions could be taken should political alliances be shifted over this money. Consider how fast Russia appropriated the Crimean peninsula. All the angles have to be considered and with Merkel’s established relationship with Putin, I don’t see the Troika being allowed to precipitate negative financial and geopolitical outcomes. What is difficult to reason, for me at least, is how the US will come to bear its influence in this whole game of thrones. America will have its say on bailing out Greece, but how and where and with what level of impact is a challenging thought experiment. Coming back to American assets and their ability to discount the European outcomes, I think the speed with which the rate-sensitive sectors dropped last week are the tell-tell signs. 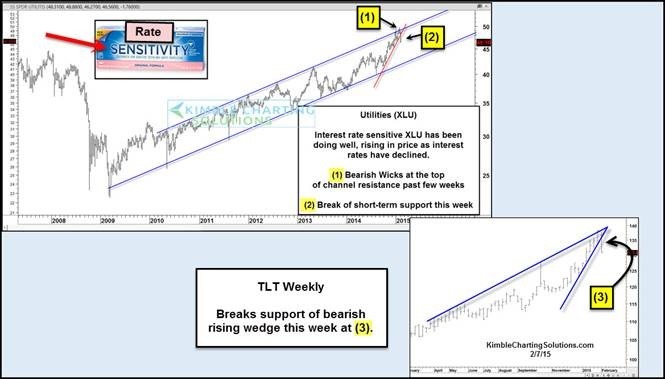 Examine the two following weekly charts of TLT and XLU. After a stellar run in 2014, that was a precipitous drop last week. The overall trend remains up, but the situation is very fluid as we have to consider the interrelationships between markets, especially the dollar and implied volatility across Treasury yields. 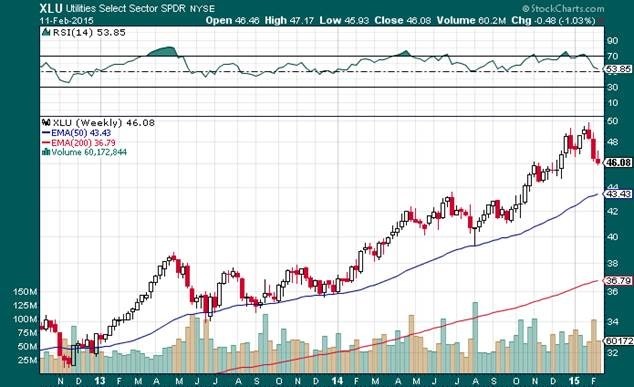 A familiar market adage is that Utilities tends to be a precursor for the greater stock markets. Any correlation is possible at any given time in the markets, however, we live in an age with remarkable volatility across asset classes. Thus, old interrelationships that once used to prove semi-reliable, may just not be so consistent. I think the Utilities, Treasuries, and yields are telling us that the general market environment is about to go risk-on with another leg-up in the greater stock markets. I agree that the next major leg down in the markets that began with the Great Recession in 2008 is near. I’ve long-stated that I thought 2015 – 2016 were going to be the years that major catalysts presented themselves for an epic sell-off, but I don’t think that time is upon us. I’m convinced that the markets will draw in a lot more participants first. I want to get that 1999 and 2007 feeling first. You know the feeling I’m talking about; that feeling that the markets will never go down and speculating in the stock market is a can’t lose venture. 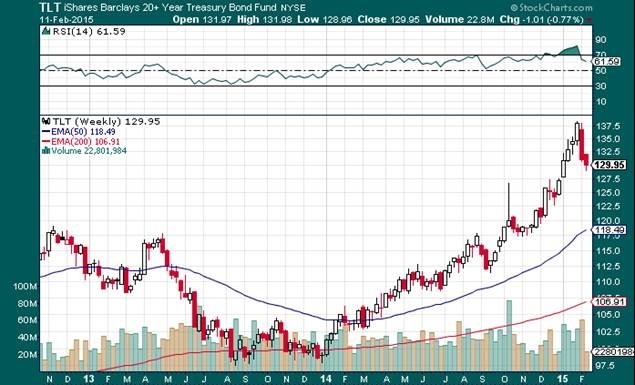 The danger of deflationary forces is reasonably priced into the markets. Japan is still easing while the Fed is continuing to roll assets and now we have the ECB embarking on a trillion dollar extravaganza. I have read analysis that the efficacy of the ECB’s easing is highly questionable due to negative rates around the continent. I say nonsense. Animal spirits only care about a liquidity buffer to fill voids. Besides in a risk-on environment, yields will rise as higher levels of capital will flow into equities in a sector-rotational chase for alpha. Risk-on is not mutually exclusive of risk management, no matter what. Countless interviews with billionaires around the world back up the fact that risk management is the number one key to successful speculation and investing. That being said, look for the general stock markets to pick up a little speed in advance of a potential workout between Europe and Greece. In just the last few days we’ve had two US hedge fund billionaires share their opinions on a Grexit. Dan Loeb, of Third Point, thinks there’s a lot of risk associated with these markets and has lowered net exposures across his funds so far this year. David Tepper, of Appaloosa, thinks there is nothing to worry about if Greece exits the euro. He basically stated that there’s a handful of percentage points of loss to worry about, but that the markets are strong enough to overcome a negative outcome. Loeb is prudent. Tepper believes in his analysis. I think the GermansEuropeans will reach an accord with Greece sometime soon(another relative term) and the stock markets will eat it up. There is still that little matter of the dollar, euro, and their extreme levels in sentiment. Carry trades continue to be wonky in light of the dollar strength. Maintain a close eye on these currencies as they will enhance a risk-on move. Whether you believe the markets are discounting future events or not, there is a persistence of extreme movements. A European resolution with Greece and a shift in dollar sentiment may just provide a profitable environment for stock market participants.